Last month, Mexican President Enrique Peña Nieto canceled his trip to the White House amid President Donald Trump’s controversial demand that Mexico pay to build a wall along the U.S.-Mexico border. President Trump’s bombastic rhetoric and isolationist policy proposals—from building a border wall to renegotiating the North American Free Trade Agreement, or NAFTA—are threatening to undermine the longstanding U.S.-Mexico relationship. Although there has been widespread discussion of the economic consequences of the Trump administration’s proposals, too little attention has been given to another major tie binding the United States and Mexico: the future of the Colorado River and water security in the American West. This column highlights the current state of the Colorado River basin, as well as its uncertain future. The Colorado River is a lifeline for much of the West. Its basin stretches across seven U.S. states before crossing into Mexico and emptying into the Gulf of California. Water from the Colorado River is used by more than 35 million people in Western communities, and it irrigates more than 5 million acres of agricultural land. Eleven national parks lie within the watershed, as do the lands of at least 22 Native American tribes. The economic impact of the river is enormous, with some estimates placing it at more than $1 trillion per year. But the dry nature of the West and a changing climate have created economic and ecological challenges for the communities and wildlife that depend on the river. The Colorado River delta has lost more than 80 percent of its wetlands and is now a parched, dusty plain for much of the year. And the water behind the world-famous Hoover Dam has dropped perilously close to shortage levels, which would mean cuts for communities and farmers in Arizona and Nevada and, if shortages deepen, across much larger swaths of the West as well. International accords on the allocation of water have been updated to plan for times of drought, but with the latest agreement set to expire in 2017, there is a great deal of doubt about the future of the river and the ecosystems and communities that depend on it. The Trump administration has the responsibility to address and alleviate this uncertainty by continuing the decades-long effort to improve water management in the basin through federal collaboration with Western states and Mexico. However, the administration needs to clarify its stance on relations with Mexico and demonstrate its commitment to productive environmental and water security policies. Any new trade deals should not be pursued at the expense of the gains made in managing the Colorado River. The Colorado River has been recognized as vital to the development of the West since before John Wesley Powell conducted early surveys of the basin in 1869, navigating the main stem of the river between the Rockies and the borders of Nevada, Arizona, and California. In this arid landscape, the river was critical to the survival of Native American tribes, frontiersmen, and settlers forging new communities in the desert. Congress approved the compact through the Boulder Canyon Project Act of 1928. This act also approved the construction of the Hoover Dam, part of a system of reservoirs that now has the capacity to store 60 million acre-feet of water for human use. In doing so, Congress also named the U.S. Department of the Interior as the party responsible for water deliveries in the lower basin, making the federal government a permanent and integral player in the Colorado River basin’s management as the region became one of the most important economic areas in the country. As metropolitan areas in the American West rapidly developed, tensions grew with the other water users in the basin, including Mexico and tribal governments that sought restored access and decision-making capacity. The U.S.-Mexico Treaty of 1944 resolved some of these international disputes, guaranteeing water flows to each country and setting a framework for coordinating future river management through the International Boundary and Water Commission, or IBWC. In addition to allocating flows, the agreement has been expanded to manage groundwater and water quality in the basin. Political and environmental realities have changed the conditions within the basin, requiring adjustments to how water is stored, shared, and managed under the Law of the River. The 1922 Colorado River Compact and the construction of the large dams on the river were the products of existing knowledge about the availability of water in the basin, but this knowledge was incomplete: The decade leading up to these initial agreements was abnormally wet, thus the agreed-upon water allocations were based on amounts that would rarely be available in years to come. In recent years, drought and a changing climate have resulted in much different conditions than those that existed when the Law of the River was established. Since 2000, the Colorado River basin has experienced the driest years in 100 years of recorded observations and one of the driest periods in more than 1,200 years. The federal Bureau of Reclamation, which tracks flow and demand in the basin, now considers the water supply to be overallocated given likely future precipitation. The water level in Lake Mead, where the Bureau of Reclamation monitors for shortages, has dropped precipitously, and government agencies are concerned that this will trigger cuts in the near future. As a result, the cities and farms using Colorado River water must look elsewhere for water, tapping into groundwater and pursuing water rights outside the basin. But their continued dependency on the Colorado River places tremendous pressure on the basin. The Colorado River delta, which once spanned more than 1.5 million acres and was a lynchpin for the region’s ecosystem and economy, covers less than 200,000 acres today. The Bureau of Reclamation must closely monitor the lower reaches of the Colorado River for excessive levels of salt due to agricultural runoff from upstream, and expensive treatment plants have been built in an effort to treat runoff for use by farmers and communities downstream. Given the region’s projected temperature and precipitation trends, the federal government has taken proactive steps with other water users to improve management of the basin. The Bureau of Reclamation has partnered with states in the lower basin to develop drought contingency plans, which include commitments to generate water savings through 2019 using conservation measures. It has also worked with tribes in the basin to quantify their water supply and demand needs. The Bureau of Reclamation, working through the IBWC, has addressed international challenges incrementally through the negotiation process under the 1944 treaty. In 2012, the Obama administration announced Minute 319, which made huge steps toward fostering resilient management of the river. It allowed Mexico to bank its water allocation in Lake Mead for future use, which had the joint benefits of giving Mexico new storage space and augmenting the water level at Lake Mead to avoid shortage triggers. In 2014, some of this storage was released in an eight-week pulse flow, which allowed water to reach the delta for the first time in years and helped agencies and other groups better understand the water management needed to restore this important ecosystem. The various agreements on the development of the Colorado River have converted the basin into an economic powerhouse. Dozens of dams store water and generate hydropower for more than 35 million people and 5.5 million acres of agricultural land. And over the past 50 years, river management has been modified to accommodate these needs while also identifying water sources for endangered species and restoration of the wetlands that once dominated the river delta. However, the water level at Lake Mead is still approaching 1,075 feet. At that point, shortage measures, including supply restrictions, are triggered by law. This declaration would require steep cuts in water allocation throughout the basin, particularly Arizona, equal to the amount of water that would serve 625,000 homes. 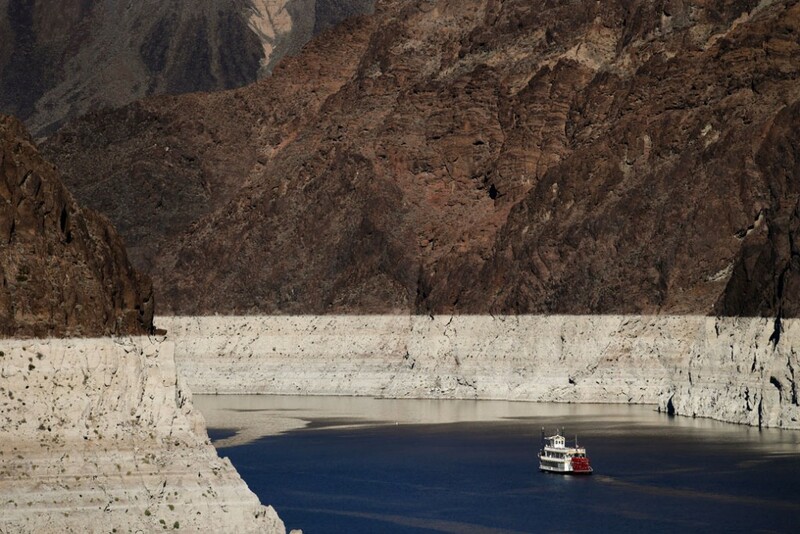 Some estimates suggest that Lake Mead could drop to the shortage level by mid-2017. In order to avoid this trigger, the federal government needs to act promptly and affirm its continued support for a successor agreement to Minute 319—known as Minute 32X—and the drought contingency plans in the lower basin that would enact additional conservation measures and reduce uncertainty. As the Obama administration ended, former Interior Secretary Sally Jewell issued Secretarial Order No. 3344, which outlined the significant benefits of conservation actions taken during the administration. It also included the activities that Interior Department agencies had pursued to meet ongoing water challenges in the basin and the actions required to complete recent negotiations and conservation plans. The Trump administration has a great deal of influence over the future of the Colorado River. It remains to be seen how the administration’s natural resources policies and international trade negotiations will accommodate the momentum developed following the Minute 319 agreements. Continuity within the Department of the Interior will be a major factor in the future of negotiations. With an interior secretary nominee from a Western state, there is some reason for optimism that the urgency of clarifying water rights will not go unnoticed. It is also critical that the Interior Department continue to work with the IBWC, which is part of the U.S. Department of State, as the new administration begins. Given that Minute 319 expires at the end of 2017, administration leadership needs to ensure that the IBWC continues negotiations under the U.S.-Mexico Treaty of 1944. This leadership is needed to collaborate with the Mexican government and shepherd future agreements without showing unwarranted preference for any particular water user. The Lake Mead projections add urgency to these discussions as Mexico’s allotment in the reservoir, coupled with U.S. conservation actions, has been critical to avoiding supply restrictions. These negotiations may be affected by the broader trajectory of international relations with Mexico. The U.S.-Mexico relationship has made increasingly positive strides in recent years, reflected not just in the management of the Colorado River but also through cooperation in trade and security that is unique to the countries’ histories. As stated above, President Trump’s campaign promises to renegotiate NAFTA and to build a wall along the Mexican border could jeopardize this momentum. In addition to setting trade rules, for example, NAFTA includes an agreement with Mexico that established the Border Environment Cooperation Commission and the North American Development Bank, which provide support for conservation and water quality efforts in the border region. Renegotiations are also certain to address agricultural trade between the two countries. Approximately 70 percent of Colorado River water is used for agricultural production, including high-value export crops. Uncertainty regarding the future of both water and trade would be detrimental to agricultural communities in both countries. The pursuit of a border wall would add further complications. Similar to much of the U.S.-Mexico border, the border region along the Colorado River has communities that are in close proximity to each other. Some of the border within the Colorado River basin already has walls and fences, but debate over additional structures should not ignore needed upkeep and management of the shared water infrastructure that is critical to both nations. The direction of U.S.-Mexico relations remains unclear, but all signs point to a shift in the status quo that focuses on immigration and trade. However, the management of the Colorado River is a clear and pressing issue, and the urgent need for greater water security in the basin should not be overlooked.